Sat 26th Jan 2019. Myself, Richard & Nick explore Rumble Chasm with Sam outside guarding the path. None of us had been in this seldom visited rift, however having connected Grove Cliff Fissure (the rift next door) to Grove Cliff Caves (AKA Flagpole) we decided we'd better have a look. The end of Grove Cliff Fissure heads South, directly towards Rumble Chasm - bet you can't guess what we're hoping to achieve! A bit of trad climbing tactics and we were up. The 10 m climb to the entrance from the path is straight forward, but loose and dirty. Richard did a lot of gardening lower down on the climb whilst myself and Nick installed a couple of bolts for descent. We then belayed Richard up and went for an explore whilst the resin set (had to waste 90 mins!). Sam declined to join us and instead decided to guard the path. The linear rift is approx 50 m long, fairly stable (compared to some of the others in the area) and of reasonable size. There are a couple of kinks to the left but essentially the cave heads straight into the cliff. There are 3 rift heading right toward Grove Cliff Fissure. The first two are too tight for their entire height being only about 4 inches wide and are found at the corners of the above mentioned kinks in the passage. The final can be found at the end of the cave where a T junction is met. Both left and right are too tight. My gut feeling is that the left hand branch in Grove Cliff Fissure may well be the same rift as found at the T junction at the end of Rumble Chasm. Checking for vocal / light connections between the two is now needed to determine if we should start digging. If anyone wishes to visit there are now two bolts suitable to rig a belay / abseil on the left just inside the entrance. At the moment there is nothing to aid the first person up. Competent climbers should have little problem as it's pretty much just big steps but feels very exposed. Sat 16th Feb - A return to Rumble Chasm. We had a group of six on Saturday so myself, Monica, Dave & Kay went for a play in Flagpole, entering Allotment Dig with the intention of ending up at the potential Rumble / Grove Cliff Fissure connection point in GCF before exiting via the GCF entrance. Meanwhile Nick & Mike headed into Rumble. The plan was to check for a vocal connection. We were very pleased when we found we could hold a conversation between the two caves! No light connection exists at present though. We spent a little time trying to work out the best height in the rift to forge a connection and then sometime thinking about how to go about it. We then all exited for lunch. Myself, Nick, Mike & Dave then all headed back into Rumble with a selection of tools. Unfortunately this one isn't going to be as easy at GCF to Skittle Alley. If we stick to our current plan, the connection will be high up and is going to involve enlarging a tight rift for several metres. We've made a start achieving approx. 1 m progress so far. It's going to be slow but is only a matter of time. Mike's also looked at the rift heading South into the unknown, opposite the potential connection point and has made around 7m of progress. No more known caves in this direction but you never know what you might find. 3 Likes Duncan Price, Oceanrower and Mr Dinwiddy like this. Saturday and Sunday 2nd / 3rd March. More in Rumble. This weekend Mike and I forged a plan to attack the Rumble dig. Saturday we spent most of the day enlarging the tight rift which turned out to be approx. 3m in length to emerge into a man sized bit of rift approx. 5 m long. At the moment the final 50 cm remains a very tight squeeze as we'd run out of drill battery to do anything about it. Immediate on entering the man sized rift is a blocked (but clearly open ahead) rift to the left which is blowing a gale. 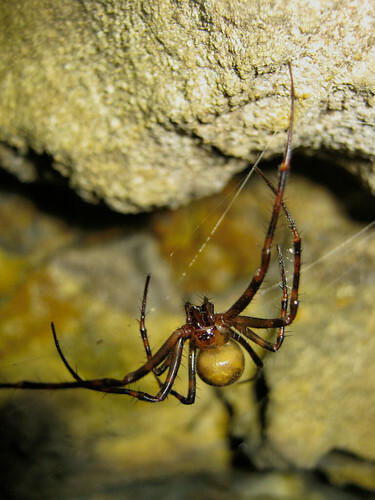 This heads inland where there is currently no known cave and is therefore on the future 'to poke' list. Unfortunately no sign of Grove Cliff Fissure. Sunday our first job was to check the vocal connection again to work out where to dig in the new bit of rift. I headed into Skittle Alley and across to GCF whilst Mike headed back into Rumble. We couldn't quite see each other, however we did have both a light and very clear vocal connection through the end of the new rift to a point approx. 2m off the floor of GCF. We guessed a gap of approx. 3 to 4 m.
Mike set too in Rumble whilst I headed round to join him. Progress was slow but a few hours later we'd bashed enough rock to allow Mike to squeeze through a 'wafer thin' gap into another small section of rift approx. 2m long. At the end of this is the final 1m (ish) of too tight rift into GCF. Unfortunately things had to be left there for the day. With any luck one more session should result in a connection. We have left two very tight squeezes at present - these will be enlarged in time. The distance between the two caves was more than we'd originally predicted. We've added around 10 m to the end of Rumble, found a promising lead and are now really close to another connection to Grove Cliff Caves. 2 Likes Graigwen and MarkS like this. 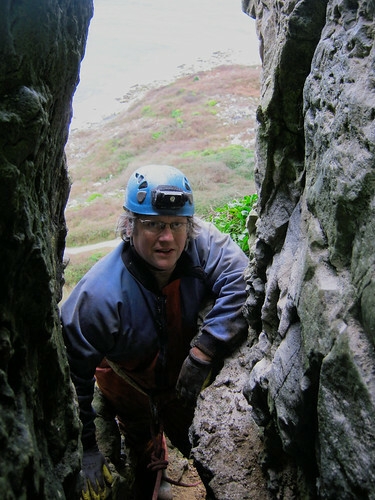 I'm pleased to report following four and a half hours of graft today by myself, Sas and Richard, Rumble is now connected to Grove Cliff Fissure. For ease of access we decided to see what we could do from the GCF side of the dig rather than traipsing through Rumble again. A lot of work with the plug and feathers but a very successful outcome. The final section of what was too tight rift between Rumble and GCF is now significantly more than Richard sized. We then improved the 'wafer thin squeeze' mentioned in my last posting on this thread such that it is also 'Richard sized'. This route now gives easier access to the newly found drafting rift. The final job will be to enlarge the remaining squeeze into what was the end of Rumble to a more sociable size (probably next weekend). Rumble is not exactly spacious in parts, so this will never be an exit of choice for larger folk however we have decided the open passage in Rumble should be the size limiting factor and not our dig hence the intention to enlarge the remaining squeeze. 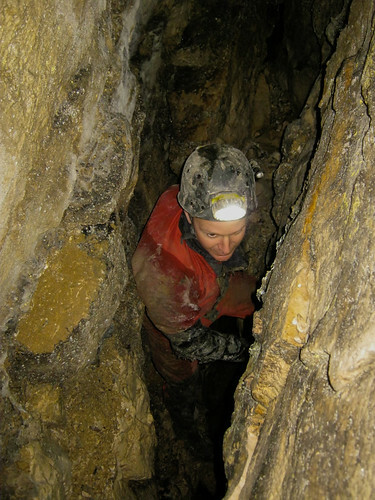 At the moment, the through trip is only suitable for 'squeeze lovers' and should only be attempted by experienced cavers. 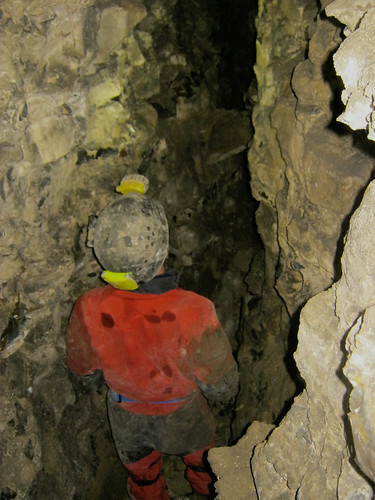 As well as the remaining squeeze, the route includes some rift climbing and traversing several metres above the floor. I'll update the Portland website once we've finished working on the connection to include a decent description of the route through. 3 Likes Oceanrower, PeteHall and aricooperdavis like this. Myself and Nick headed over to the Rumble connection - an hour later the remaining squeeze at our breakthrough point had been enlarged sufficiently. Gaynam magically appeared behind us and then him and Nick completed what we're assuming is the first through trip to exit from Rumble Chasm. I returned back through Grove Cliff Fissure to Skittle Alley entrance with all the digging tools (i.e. the easiest way out)! 1. Most of Rumble is tight and awkward, if you're struggling through the connection the rest of the cave is unlikely to be any better. 2. Definitely not for novices. 3. There is a very dodgy choke which must be passed underneath on the way out. It's not immediately obvious in this direction how precarious these boulders are so extreme caution is required. Meanwhile Sas & Richard (later joined by me) started attempting to survey the whole lot. It's a game of 'teach ourselves surveying' so there's a lot of making it up as we go and let's just say it's proving very slow at the moment. We've generated a load of data and covered about 3rd of the cave so far (Allotment Dig, Flagpole Rift, Guano Rift and the attic). Assuming we produce something worthwhile it'll be made available once complete. I've updated the Portland website to include details of the connection and through trip. You'll need to look at the Rumble, Grove Cliff Fissure and Grove Cliff Caves pages. There's also an updated version of my sketch survey which will hopefully be replaced with a proper one in the near future.